Soft racks for hauling stand up paddle boards $5.00/24hour. ( not recommended for Hwy use) also to be used at your own risk. For safety reasons a wetsuit is required when taking stand up paddle board rentals into the ocean. 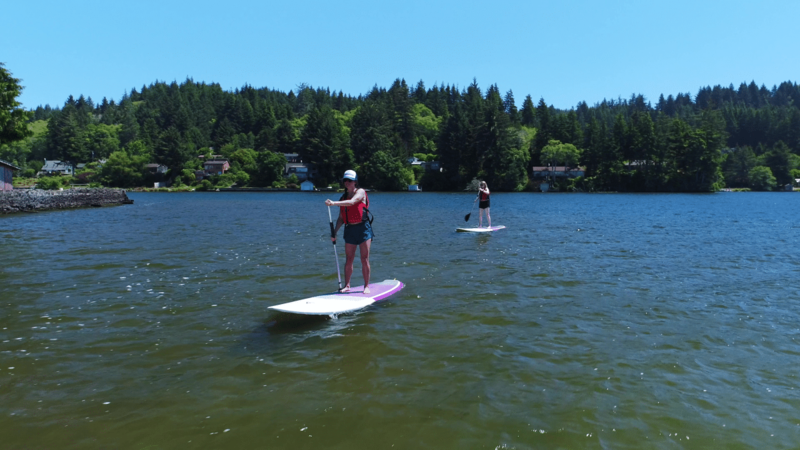 All Stand up Paddle Boards 10′ and over will also include an invasive species permit. Need your Stand up Paddle Boards Delivered in the Lincoln City area? You will need a roof rack to safely transport Stand up Paddle Boards safely. Most factory racks will also work, but we encourage customers to check the weight restrictions of their rack. It is your responsibility to check the load limits of your rack before attempting to haul a Stand up Paddle Board. We also suggest customers bring nylon rope or an extra tie down straps to also secure the SUP to the front bumper of your vehicle. This helps keep the SUP from wanting to lift up and putting excess stress on the rack. A little extra time securing your Stand up Paddle Board to your vehicle can help keep you and others safe! Customers are responsible for makng sure SUPs are secured safely to their racks, and for returning SUPs in the same condition in which they received them. A valid credit card is required for deposit. We require 72 hours cancellation notice. Cancellations after the 72 hour limit, or no shows will be charged the normal rental fee!